Wow. It’s hard to believe it’s already well into the second week of May already. It feels like it should still be April. Or, if I’m being honest, January. We all know that time seems to whizz by. No sooner do we put away the holiday decorations and it’s time to take them out again. So, too, for writing groups. I’ve noticed small groups tend to wax and wane, some succeeding and thriving, others burning brightly for a short time and then fizzling. There’s an old adage about groups, that they have several phases: “Forming, Storming, Norming, and Performing.” It’s an idea that a guy by the name of Bruce Tuckman proposed way back in 1965 and it’s still true today. Some folks add “Adjourning” at the end, to signify that not all groups survive through the performing state to continue. That’s why I’m so pleased about Writer Zen Garden. The group as it is today is the merging of two different groups; the original Writer’s Retreat that started in March of 2008, and the local Meetup group and international online forum of Writer Zen Garden. We’re still going, and we launched this new website, where you’re reading this post, in March of 2016. 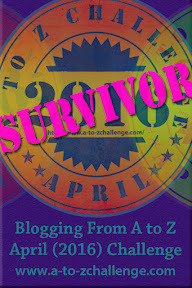 One reason I keep coming back to the A to Z Blog Challenge, is that I find it pulls the team together. Even if we’ve slacked off from posting on the blog, by doing the challenge, we come together as a group and gather ideas and write. Since on of the central missions of the Writer Zen Garden is to Help Writers Get On the Page, this is all to the good, as far as I’m concerned. Next year, we might even come up with a joint theme ahead of time – we’re still noodling ideas for what to post for this year, so it’s definitely a work in progress. I want to thank you, Dear Reader, for visiting us and leaving comments for the various authors of the Garden. We sure appreciate your interaction. We invite you to join the discussion in other ways, if you’ve a mind; we have a Facebook group; a live in-person Meetup group in Chicago, if you’re in the area; a Twitter stream; and an international writers forum. We’re glad you’re here! *Note: if you’re interested in joining the forum, please let me know in the comments or PM me on Facebook, and I’ll reach out to you by email. This entry was posted in Blog and tagged #atozchallenge, A. Catherine Noon, Noon and Wilder, Rachel Wilder, Reflections, Writing. Bookmark the permalink. Thank you for joining in the challenge! I’m glad you found it fun and inspirational. And yes, smelling flowers is very important!! Absolutely! I enjoyed it too; I’m already looking forward to next year.